October 16th, 2015. Today Allisa James of DualShockers published her interview with Digimon Story Cyber Sleuth producer Habu Kazumasa, conducted at New York Comic-Con just last week. In it, Habu describes how the game is designed "so people not familiar with Digimon would still be accessible," while at the same time "trying to target to older fans who were fans of Digimon as kids." Habu stressed that both the Cyber Sleuth team and those responsible for Digimon Adventure tri. 's development felt it was important to "take care of" their teen and adult fans, though the two groups were not actually collaborating. Cyber Sleuth had already finished development by the time work on the movies began, making the current direction of the franchise something of a happy accident. The international debut of Cyber Sleuth came at the intersection of the franchise's new direction and immense western interest in the game. Habu was surprised by the passion of fans in the US, stating that seeing the Operation Decode petition made Bandai realize they could bring Cyber Sleuth to international players. He also referred to having a "sense of honor" about localizing Cyber Sleuth for the western market, nearly ten years after the second game in the Digimon Story series (Sunburst/Moonlight) had been translated in the west. A similar statement was made in his Gematsu interview from the same day. Habu remained vague about just how many copies Bandai wants Cyber Sleuth to sell in order to secure Digimon's future in North America, but suggested reaching the same figures as in Japan. This would be about 120,000 units in ten weeks, four times the initial western sales of Digimon Story Sunburst/Moonlight in 2007. If Cyber Sleuth were to hit these numbers, it would tied with Digimon Savers: Another Mission for the fifth best-selling Digimon game of all time, surpassed by Digimon Adventure Anode Tamer, Digimon Story Sunburst/Moonlight, the original Digimon Story, Digimon World 2, and the fifteen-years record holder Digimon World. On October 13th, JakeJames Lugos of The Koalition also published a video interview with Habu, who spoke through a translator. Here too Habu stressed the importance of the Operation Decode petition, emphasizing the 65,000+ signatures and his gratitude to those fans for demonstrating their enthusiasm. Habu reiterated his points about targeting both core fans and newcomers, and also revealed near the end of the interview that the original idea for the Cyber Sleuth's online multiplayer came from the handheld Digimon toys, referring to the Digital Monster, Pendulum, and Digivice games from 1997-2001. 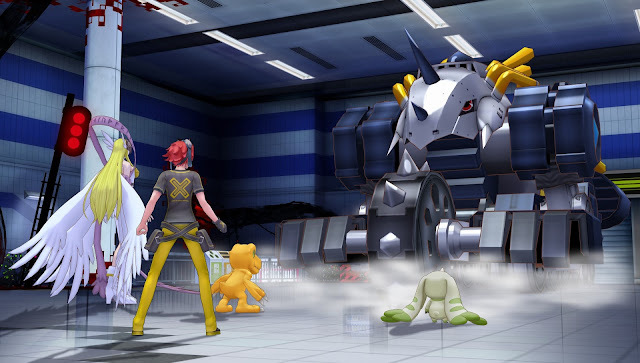 The Cyber Sleuth team wished to expedite the experience of battling and make it easier for Digimon tamers to do so.